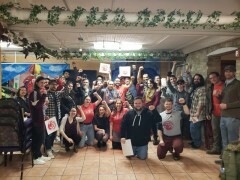 Milwaukee celebrates International Women's Day | Fight Back! Milwaukee, WI - On March 16, more than 50 community members celebrated International Women’s Day, an annual event hosted by Milwaukee’s Freedom Road Socialist Organization (FRSO). The event addressed the struggle for women’s liberation and the vital work that women do in our communities. Milwaukee FRSO commemorated women in the past who have fought for the liberation of oppressed people along with local women organizers for their efforts and leadership in the Milwaukee community. Isa Cortez, chair of the Young People’s Resistance Committee (YPRC), was one of the organizers whose work was highlighted at the event. Cortez stated, “It has been and will continue to be women at the front of revolutionary movements that will bring about the liberation of all peoples." Abi Gonzalez, co-chair of YPRCs community chapter, talked about her experience as a leader and queer woman of color. As part of her speech she stated that her identity as a queer, Chicana woman has been reinforced and emboldened, as she surrounds herself with other strong resilient women leaders. Milwaukee FRSO will continue to work towards women’s liberation, and the liberation of all peoples. International working women’s day continues to be a strong, unifying celebration of the contributions made by women, that are key for revolutionary movement to flourish.